TALKS BETWEEN THE government and nurses have been referred to the Labour Court after nurses’ unions rejected government draft contracts as “unreasonable”. It follows an extraordinary general meeting of the Irish Nurses and Midwives Organisation this afternoon to decide what steps to take in the ongoing nurses’ dispute. Negotiations ended without a deal last night, when representatives for the nurses and midwives said there remained “a very large gap” between their side and the Government. Talks come after nurses went on general strike for a number of days in February, protesting against what they call a recruitment and retention crisis in the sector. The government initially refused to budge on its position over wage increases for nurses, before the Labour Court intervened to avert further strikes. As part of that recommendation, negotiations are ongoing between all sides on a new contract for nurses. 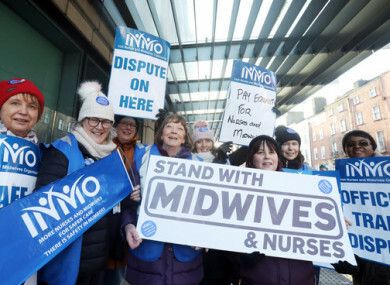 Balloting on the proposals had been expected to start today, but INMO chiefs decided to postpone the start of balloting by two weeks, in line with a decision that members would not be balloted without what the union felt was a satisfactory contract. Following the latest breakdown in talks, discussions have once again been referred to the Labour Court. The Court is expected to examine the disputed clauses of the new draft contract, and the HSE, the Department of Health, and the Department of Public Expenditure are expected to attend. “We are deeply disappointed with the government’s attempt to stretch the limits set by the Labour Court in these contract talks,” INMO general secretary Phil Ní Sheaghdha said. “The government’s contract proposals are unacceptable to us and would only worsen the recruitment and retention problems. INMO general secretary Phil Ní Sheaghdha previously told RTÉ Radio One’s Today with Sean O’Rourke that they were “very disappointed” that their employer only met with them this week following the Labour Court recommendation last month. “We engaged all over the weekend and on a couple of evenings last week with the employer, with the view to getting a contract that would actually improve recruitment and retention,” Ní Sheaghdha said. “The contract that was presented was way outside of the scope of what the Labour Court had instructed and we sought to get it back into that space over the weekend,” she said, adding that “at the moment, we’re at a point where it still isn’t there”. “There isn’t any indication from our end that this contract would be acceptable to our members,” she said. The union’s executive council is expected to meet again on 20 March. Email “Talks between INMO and government to return to Labour Court as union rejects new nurses' deal”. Feedback on “Talks between INMO and government to return to Labour Court as union rejects new nurses' deal”.